Good episode this. Love the line above "I don't think you've met my new Minder Ray Daley...."
Classic. Also that Mark 2 Golf GTI is a nice motor. Classic episode and motor oufc. I watched this again today and still think it's a great start to the Ray Daley era. 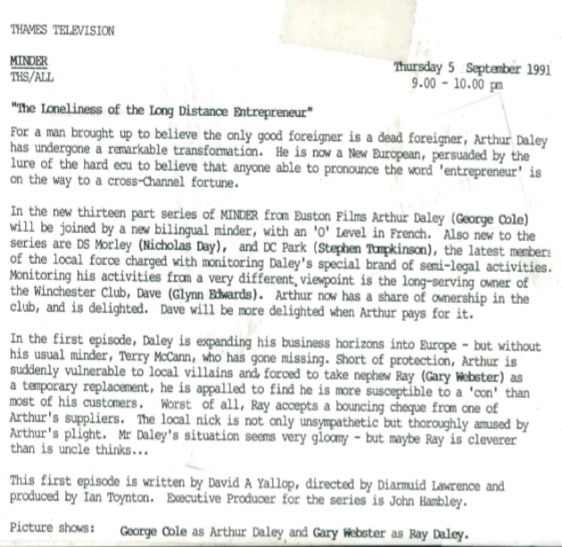 Having just finished watching the last episode to feature Terry McCann, it's difficult not to measure it up against this first instalment to introduce our new minder Ray Daley, and it pains me to say how much I disliked 'The Loneliness of the Long Distance Entrepreneur'. When watching this it struck me what a shadow of its former self Minder had become by this point. With its tongue now firmly planted in its cheek, I find it a bit of a stretch to expect the audience to believe that the character of Arthur Daley is now the don of the manor, the fixer, revered by family members as he holds court at a wedding reception. Or that he is no longer a self-preserving coward who scarpers at the first sign of trouble, instead fearlessly fronting the three cartoon villains as he calmly strolls into the Winchester. As for Terry; he gets married and moves to Australia. Really? This just strikes me as out of character. And it's the little details like the sudden change of Dave's attire to the cheesy incidental music that all add up to a disappointing experience. On a positive note, top marks go to Gary Webster, who, in the unenviable position of having to fill Dennis's boots, brings a certain vulnerability and innocence to the character; managing to stamp his own mark on the series from the off. As a run-of-the-mill comedy-drama it scores an 'average', as a Minder episode it gets a 'poor' from me. Fair points taken there, but comparing back in the day, sitting down in the 90s and watching this then as opposed to a repeat festival was different. Almost three year gap, the world was arguably a simpler place and after an extended gap, it was great to have the show back on telly even without Dennis. 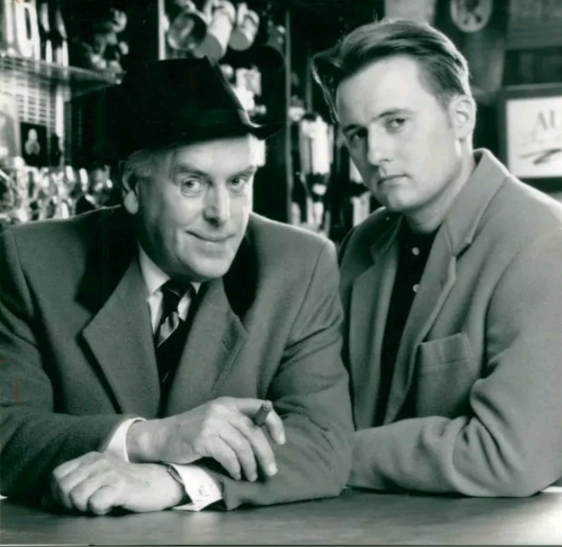 This was 90s, Dennis was 80s, things had become slightly less shoulder pad and more mobile phone - for me this was an ideal transition from 80s to an updated 90s Minder - it could never be the same show, it moved with the times and incidental music was simply part of its 90s character. For me this didn't make the concept of what Arthur did any different, just switched the focus away from squabbling couple to uncle/nephew with an updated 90s feel. Watching this now and with the exception of the GW getting top marks (always thought he was poor,especially in the early episodes) couldn't agree more.Banging on about 'family' got really tedious for me over the coming episodes. Just noticed when Park and Morley find the stuff in the spare wheel,Park calls it cannabis,but Arthur who doesn't even do paracetateemol,adds the word resin. Anyone know the name of the second song played at the wedding? Thanks to flyingsquad... I believe it could be 'The Godfather' theme which coincides with the cloak room scenes.